The Edgefield County Historical Society will celebrate the completion of the restoration of Horn’s Creek Church and the 250th Anniversary of its founding at its Spring Meeting on Sunday afternoon, April 15, 2018 at 3:00 p.m. Dr. A.V. Huff, Professor Emeritus of History at Furman University, will deliver the keynote address. Dorothy H. Kendall, M.D. of Eastover will lead in a special musical presentation, harkening back to the singing of hymns which was done at the time of the Church’s founding. Colonial and Revolutionary reenactors will present colors and will fire a salute in honor of the Church’s 250th Anniversary. Following the meeting there will be an ice cream reception on the grounds. This will truly be a memorable and historic event, and all interested parties are invited to attend this occasion. 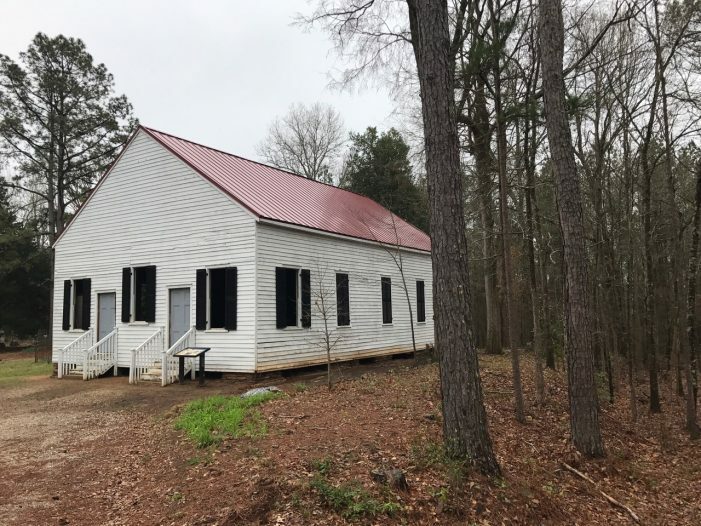 Since the Society acquired title to Horn’s Creek Church from the Edgefield Baptist Association in 2002, it has shouldered the heavy obligation to preserve and restore this historic treasure of Edgefield County. The Society recognized that the Church was one of the oldest – if not the oldest – structure in Edgefield County. The church itself was organized in 1768, and the Society’s best estimate, based upon architectural and documentary evidence, is that the current building was constructed as least as early as 1784 when the property was platted and conveyed to the original Trustees. This church building is a monument to the beginning of religious fervor in the South Carolina and Georgia backcountries in the 18th century. Almost all of the Baptist churches in this region, including Stevens Creek Baptist Church in Edgefield County and Kiokee Baptist Church in Columbia County, Georgia, trace their roots to the ministry of the renowned Baptist Devine, Daniel Marshall (1706-1784), who founded Horn’s Creek Baptist Church in 1768. The Society was so keenly aware of the importance of this Church that it undertook several years ago to have a comprehensive history of the early years of the Church written and published, copies of which can be obtained from the Society by calling Carolyn at 803-637-2233. Horn’s Creek Church is also significant because one of Edgefield’s most important pottery entrepreneurs, Reverend John Landrum, was the pastor there for nearly forty years. As Reverend Landrum owned the Slave Potter Dave, it is likely that Dave attended Horn’s Creek Church from time to time with his master. Horn’s Creek Church is therefore one of only two extant structures which can claim close association with Edgefield’s renowned pottery heritage. The Society’s long-term vision for the Church is that it will become a museum for the rich Colonial, Revolutionary and Early National history of Edgefield County, as well as an event center for church services, meetings, concerts, weddings and other gatherings. It is anticipated that the rental revenue derived from the events held there will provide income to maintain the property. The Society’s first efforts at restoration of Horn’s Creek Church were frustrated by the destructive vandalism which continued unabated while the property was remote and uninhabited. Ultimately it was decided that no further efforts at restoration were warranted until the property could somehow be protected. Although the Society had not anticipated having to make a major investment in the property before restoring the Church building, it finally concluded that it had to construct a caretaker’s cottage on site to protect the property. With the support of much volunteer help, generous contributions, and a mortgage loan from a regional bank, the construction of the cottage was completed in 2015 and has been successful in ending all vandalism. The cottage is, by all accounts, a very credible structure, much in keeping with the architecture of the Church. About this same time, the Society was fortunate to secure Barney Lamar, a Beech Island native with deep Edgefield County roots, to be the caretaker of the property. Mr. Lamar is a restorer of fine art and has a good grasp of local history. The Society could not have found a more ideal caretaker for Horn’s Creek Church. His wonderful collection of art is beautifully displayed in the cottage and provides another interesting element for visitors to see. During this past year the Society has turned its attention to restoring the Church building itself. With the help of a $50,000 grant from the South Carolina National Heritage Corridor and with many contributions from individuals to match the grant dollar-for-dollar, it will shortly complete the restoration of the Church. When completed, the Society will have spent approximately $270,000 on the entire project and will have preserved this most important part of Edgefield County’s religious heritage. The Celebration on April 15th will truly be a memorable and historic event and all interested parties are invited to come for this occasion. There will be no admission charge and all are welcome. In 1760 the South Carolina backcountry was suffering badly from the effects of the Cherokee War which had begun on February 1st of that year. Although the settlement of the area had begun about a decade before, the entire region was in a state of great disruption as a result of the massacre of many settlers. Being terrified by the fear of the Indians, many settlers had abandoned their farms and fled to hastily-constructed forts in Augusta and Ninety Six. In the vacuum which was left, many outlaws and other undesirable people flocked into the area and began to prey upon the honest and hardworking settlers who remained. Since no law enforcement had been established in the region, some of the law-abiding settlers banded together in America’s first vigilante group which became known as “the Regulators.” A number of Regulator events occurred right here on Horn’s Creek in which “raw justice” was dispensed to those suspected of crimes. Although some efforts had been made by the Anglican and Lutherans to bring religion to this part of the backcountry, none of these efforts had had any substantial impact. It was not until the early 1760s that a major religious revival was to take place in Edgefield County, and then it was due to the efforts of a remarkable “Separate Baptist” evangelist, the Reverend Daniel Marshall (1707-1784). Born in 1706 in Windsor, Connecticut, Daniel Marshall united with the Congregationalists at age twenty and was elected a deacon, a position in which he served for twenty years. He became a prosperous farmer and was married twice. At the age of thirty-eight in late 1744 or early 1745, his life was changed dramatically when he heard a sermon by the Reverend George Whitefield (1714-1770) and was inspired to give the remainder of his life to spreading the Gospel of Jesus Christ. George Whitefield was an English Anglican preacher whose remarkable speaking ability and inspiring message caused him to become the best known preacher in Britain and America during the 18th century. In 1738 Whitefield made the first of many trips to the American colonies. In 1740 he preached a number of revivals up and down the colonies from Georgia to Massachusetts which came to be known as “the Great Awakening of 1740.” He was largely responsible for the religious revival which swept the American colonies during the 1740s. Whitefield’s preaching style was novel and extremely popular. His detractors said that he was more of an actor than a preacher. But his message was different too: Whereas Anglican ministers typically emphasized religious ritual or moral living, Whitefield preached “conversion” in which the individual must be inwardly changed through faith in Jesus Christ for a personal salvation from sin, to experience a new birth through the Holy Spirit. That conversion and regeneration could be experienced in an instant, if only people would repent and believe. Whitefield had remarkable charisma and a strong and pleasing voice. It was said that his voice could be heard for over five miles. He became a close friend of Benjamin Franklin who admired his abilities. Franklin calculated that Whitefield could be heard by over 30,000 people in the open air. It is hard to overemphasize the tremendous impact that George Whitefield and the Great Awakening had on the American colonies during the 18th century. Daniel Marshall was so inspired by Whitefield that he left his comfortable home in Connecticut in 1751, sold much of his property and went out as a Christian missionary to spread the Gospel among the Mohawk Indians in New York State. With the outbreak of the Indian wars, Marshall removed through Pennsylvania to Virginia where he became acquainted with the Baptists. Here, in 1754, at the age of forty-eight, he and his wife were baptized and he was licensed to preach. The Marshalls’ decision to become Baptists was probably a result of the fact that the Baptists seemed to be more in sync with the inspiring message of Whitefield than the Anglicans, many of whom had begun to disavow and criticize the great evangelist. The mainstream Anglicans thought that Whitefield was wrong to emphasize conversion; that he was too flamboyant; and that he should not claim to have had a personal revelation from God. Some of the established Baptists also felt that Whitefield was too revolutionary in his beliefs and style. But those Baptists like Marshall who had been inspired by Whitefield were unmoved by the criticism. They believed that Whitefield’s message was just what the individual sinner needed, and that personal conversion and repentance was the only path to God’s favor. Not willing to be restricted by the Baptist establishment, these preachers began to call themselves “Separate Baptists” or “Irregular Baptists,” and refused to bow to the “Regular Baptists,” as the established Baptists began to be known. The Reverend Daniel Marshall was very successful in spreading the Gospel. His piety, earnestness and honesty were powerful assets in winning the souls of sinners. Additionally, his wife, Martha Stearns Marshall was noted for her zeal and eloquence and added greatly to the interest of the meetings conducted by her husband. In 1755, Marshall, together with his brother-in-law, Shubal Stearns, moved from Virginia to North Carolina, going first to Sandy Creek in present-day Randolph County, southeast of present-day Greensboro, where they established a church with 14 initial members. During the next two years the Sandy Creek Church grew dramatically, reaching a membership of 606. In 1756, Marshall left Sandy Creek to establish another church at Abbots Creek, just east of present-day Winston-Salem. Then, in 1760, Marshall removed to Beaver Creek in South Carolina, a tributary of the Broad River in present-day Fairfield County. After several years there, he came to Horn’s Creek, about fifteen miles north of Augusta, where he settled in 1762. When Marshall arrived here in what was to become Edgefield County, he began preaching throughout the area wherever he could find a crowd to listen. One of the first sites where he preached was on Stevens Creek, some ten miles north of Augusta where, in 1762, he established his first church in Edgefield County. He had probably began preaching in the open air in a clearing in the woods just like Whitefield who had inspired him. Then, some four years later, in 1766, a “Meeting House” at Stevens Creek was built. As he had done at Stevens Creek and other locations, Marshall probably began preaching in a clearing in the woods and then later may have built a brush arbor. The initial church building, or meeting house was probably built some years later. We have no information as to exactly when the first church building was constructed, except that we know that the building was there in July of 1784. The names of some of Marshall’s initial converts at Horn’s Creek were Benjamin Ryan and wife, Laurence Rambo, Nathan White, John Cogburn and wife, Joseph Walker and wife, and Peter Youngblood and wife and son, Jacob. After spending more than a decade in South Carolina, Marshall moved across the Savannah River in 1771 where he began preaching on Kiokee Creek near Appling in what is now Columbia County, Georgia. There, in 1772, he founded the Kiokee Baptist Church which grew under his leadership to be a large church and the “mother church” for many more Baptist churches in Georgia. Shortly after Daniel Marshall’s death in 1784, the Horn’s Creek Baptist Church property was deeded to three Trustees of the Church with the annexed plat making reference to the “meeting house which now stands.” The church was incorporated in 1790 under the leadership of Hezekiah Walker. Other early pastors include Charles Bussey, John Landrum and Samuel Marsh. In the years following, Horn’s Creek Baptist Church became one of the largest churches in the Edgefield District with a membership of more than 300 persons, including both whites and African Americans. Indeed, it became the “mother church” of many of the Baptist churches, including Edgefield First Baptist Church (formerly known as “Edgefield Village Baptist Church”) and Mount Canaan Baptist Church which was founded by the Reverend Alexander Bettis in 1867.